That Ineffable Name, meaning the Self-Existent Being who is infinite without Beginning, or End. This Ineffable word having been hidden by the patriarch Enoch faded from memory until it was revealed to Moses in the burning bush. Following the Exodus, Moses had the Name engraved upon a plate of gold and placed it in the Ark of the Covenant which was constructed to hold the remains of the Ten Commandments, and there it remained until the time of Joshua and the Judges who ruled after him. Moses was forbidden to utter the true pronunciation to the people, just as modern Jews are afraid to do to this day, he communicated it to Aaron and to Joshua; and it was afterwards made known to the Chief Priests alone who revered it in sacred ritual. In the time of Samuel (1 Sam. 4) the word was lost yet again due to the Philistines capturing the Ark. The Philistines killed Ophni and Phineas, the sons of Eli, then took the Golden Plate from the Ark with the Word inscribed on it and melted it into the image of their fertility and fishing God Dagon causing the Ineffable Name to be lost again. Time passed, as the word was lost again until the time of Solomon. 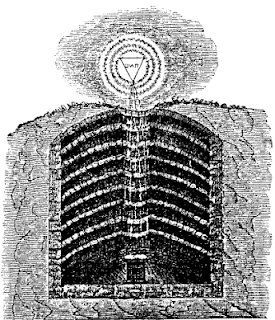 Upon laying the foundation for the great Temple of Solomon upon the base of Mount Moriah the builders Adonhiram, Joabert and Stolkin stuck a compartment buried deep in the earth, they had discovered a Secret Vault. They reported to King Solomon, and him fearing of it being an ancient Pagan temple ordered the builders to excavate it. Upon which upon excavation the Builders discovered a vault, which lead down through eight other vaults leading deeper into the darkness. They then found a long and narrow passageway, which led to the ninth vault, which was under the space, which would become the Holy of Holies of the Temple. 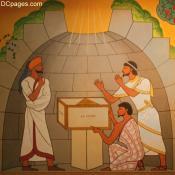 They had discovered the cube of Foundation and the Mysterious Name, and delivered it to King Solomon. The two Kings, after much deliberation, determined what to do with this discovery. They decided to deposit the Word in a secret vault to be constructed under the Sanctum Sanctorum. The stone of foundation was so deposited as the cornerstone of the temple, so that the Temple of Solomon may be the physical manifestation of God on Earth. At this first cornerstone laying ceremony it is said the workmen came forth and gave of their wages of corn, wine, and oil then they all knelt and returned thanks to God. Then the correct pronunciation of the Sacred Name was permitted to three masters Adonhiram, Joabert, and Stolkin within the secret vault. In Cryptic Masonry King Solomon had constructed a narrow passageway that lead from his palace to the ninth vault was in that apartment King Solomon held his private conferences with King Hiram of Tyre and Hiram Abiff where the long lost Ineffable Word was revealed to them. After the Death of Hiram Abiff the two kings abandoned the secret vault never again to return until they found a suitable replacement for the fallen master. Both Cryptic Masonry and the Ineffable Degrees have similar lore which differ slightly after Solomon’s abandonment of the Sacred Vault, he assigned guards stationed guarding the approaches to the Sacred Vault, the oldest being stationed at the entrance to that Vault, and the others respectively at the entrances of the other eight, or in the Cryptic Rite there is but one Guard at the front entrance, Zabud a dear friend to King Solomon. Hiram Abiff constructed the private entrance to the Secret Vault with the aid of Phoenician Architects who were initiates of the Mysteries sworn to secrecy as to its existence. No one knew of it except the two Kings and those three Masters. To none others was the Ineffable Name communicated, it was lost to all those of an inferior degree. Those who were not worthy to know the word were given only the substitute, adopted at the death of Hiram Abiff, as the Master Mason’s Word. The Ineffable Name remained in the Secret Vault hidden from prying eyes and faded into memory. When Nebaconezzer, King of Babylon invaded with his armies he burned the temple to the ground and plundered Israel taking the Jews into captivity back to Babylon. But the Sacred Vault remained unspoiled and unnoticed by the foreign invaders. So the word was lost again.